Fellowcraft Degree April 26! 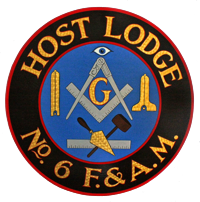 – Host Lodge #6 F. & A.M. Host Lodge #6 F. & A.M.
Past Masters of Lebanon Lodge #6 F. & A. M.
Past Masters of Stewart Lodge # 34 F. & A. M.
Past Masters of Hobart Lodge # 175 F. & A. M.
← Back To Back Degrees! A reminder that this Wednesday, April 26, we are having and emergent communication to confer the Fellowcraft Degree on worthy and well-qualified candidates. We hope that it is within the length of your Cable Tow. Lodge opens at 7:00 PM, so the degree can commence at our usual starting time.